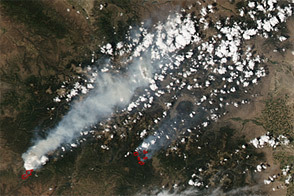 The High Park Fire, about 15 miles (24 kilometers) west of Fort Collins, Colorado, was discovered just before 6:00 a.m. on June 9, 2012. Started by a lightning strike, the fire quickly grew, fueled by high winds and dry vegetation. 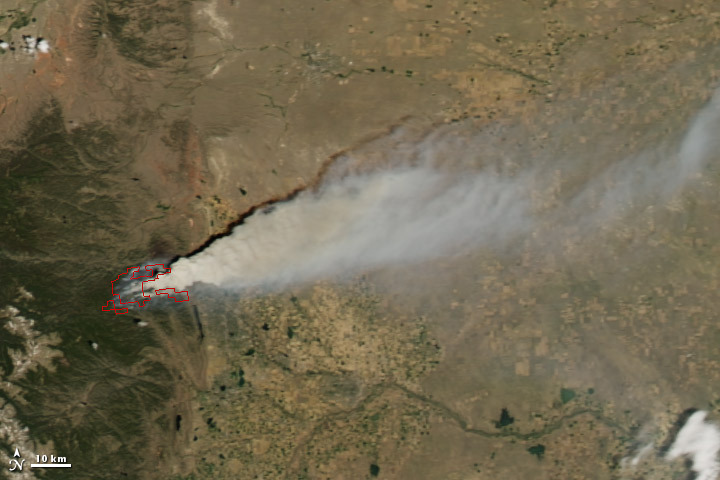 By the morning of June 12, the fire had burned more than 43,000 acres (17,000 hectares), making it the third-largest fire in Colorado history. The Moderate Resolution Imaging Spectroradiometer (MODIS) on NASA’s Aqua satellite captured these images on June 9 (top) and June 10, 2012 (bottom). Red outlines show the approximate boundaries of actively burning fires. Thick smoke was carried eastward on both days. As of June 12, the fire had burned 100 structures and killed one person. 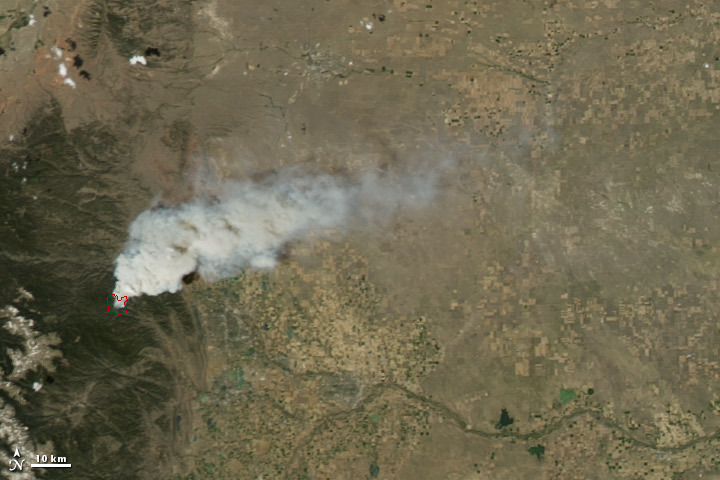 Though regional firefighting resources were stretched thin between Colorado and other active fires in Wyoming and New Mexico, about 500 firefighters were battling the High Park blaze by June 12. Firefighters hoped to establish a fire line along its southwestern corner, according to reports from InciWeb. Smoke from the fire affected air quality up and down the populous Colorado Front Range, the eastern face of the southern Rocky Mountains. Officials warned residents to take precautions if they could see or smell smoke, and a Fort Collins hospital reported an increase in emergency room visits related to smoke inhalation. Much of the fuel for the High Park Fire is coming from stands of trees that have been killed by beetles; the insects have devastated forests in western North America. Effects of the beetle outbreak in British Columbia can be seen in a color-coded map and satellite imagery. In northern Colorado, the High Park Fire was also burning green grass in some places, the local fire chief said. 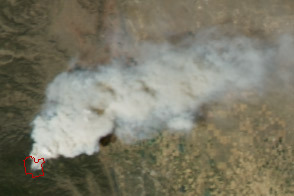 Fires and smoke in western United States. June 9, 2012, morning overpass. 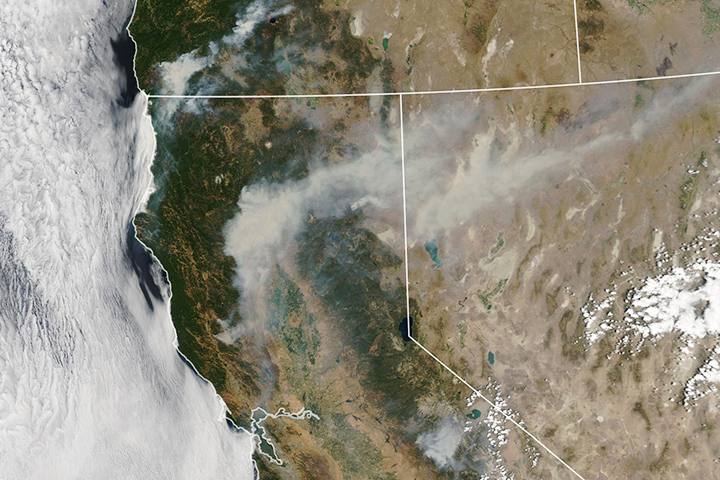 Fires and smoke in western United States. June 9, 2012, afternoon overpass. High Park Fire, Colorado. June 11, 2012, morning overpass. High Park Fire, Colorado. June 11, 2012, afternoon overpass. NASA Earth Observatory Insect Damage in British Columbia Forests. 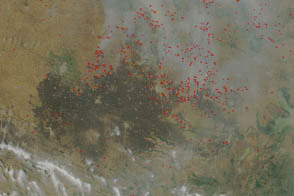 NASA Earth Observatory Pine Beetle Infestation in British Columbia. 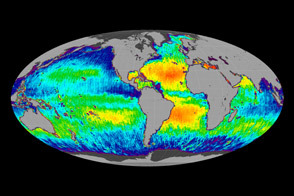 NASA Earth Observatory image by Jesse Allen, using data provided courtesy of the LANCE MODIS Rapid Response team. Caption by Michon Scott. Natural-color images document the spread of fire across a dry and beetle-damaged landscape. 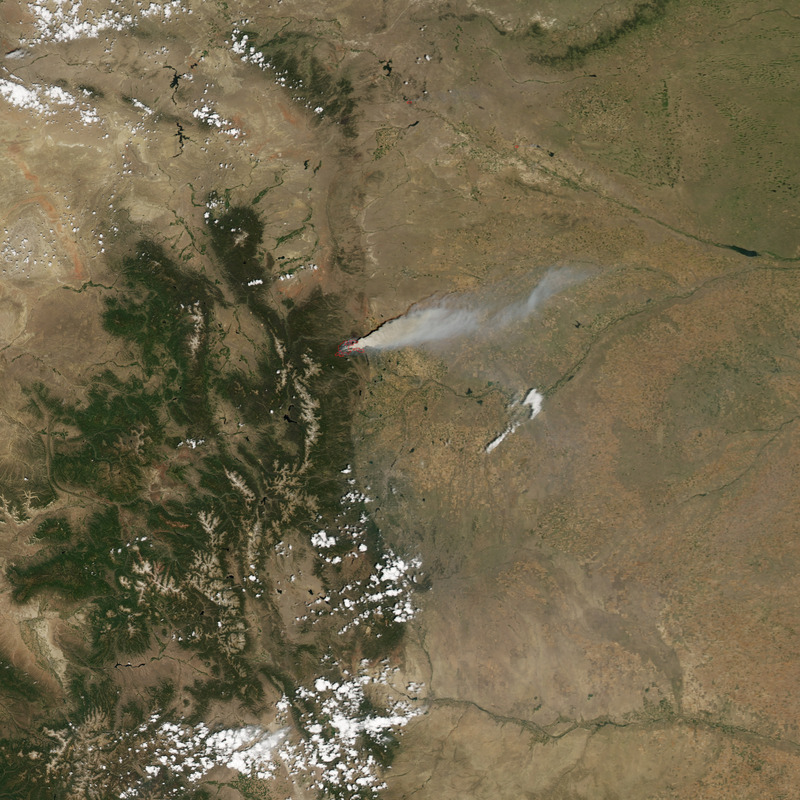 The High Park Fire broke out west of Fort Collins, Colorado, in early June 2012, and spread rapidly. 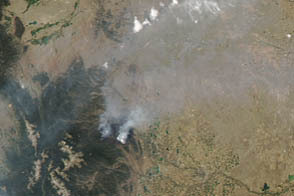 Booth, M. (2012, June 12) Colorado wildfire: If you see or smell smoke, take precautions, health experts say. The Denver Post. Accessed June 11, 2012. InciWeb. (2012, June 12) High Park Fire. Accessed June 12, 2012. McGhee, T., Whaley, M. (2012, June 11) Colorado wildfire: Federal firefighters due to help at High Park fire. The Denver Post. Accessed June 11, 2012. 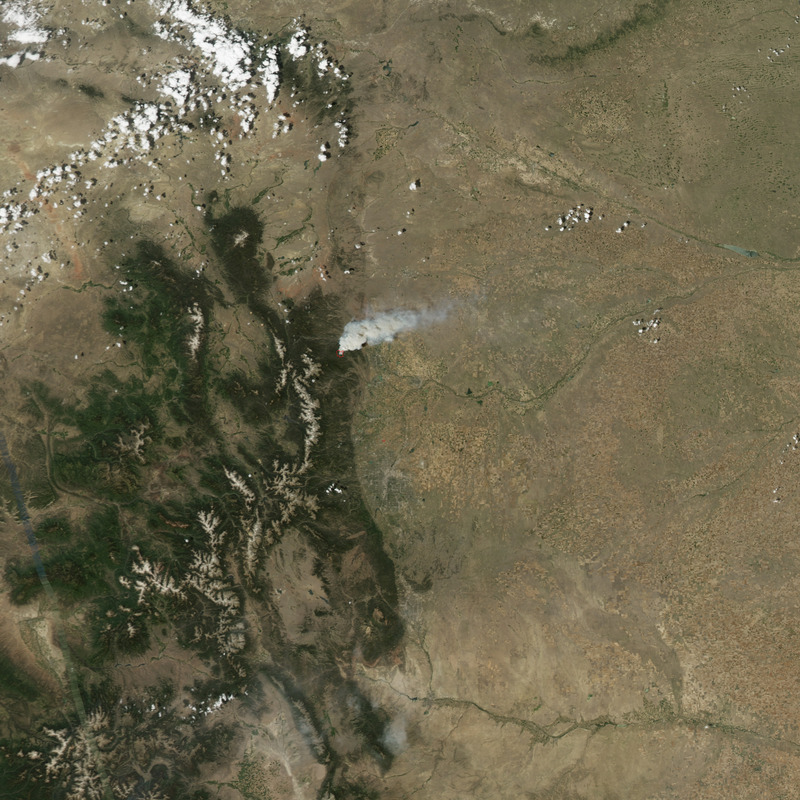 Nicholson, K., Whaley, M. (2012, June 11) Colorado wildfire: High Park Fire in Larimer County now nearly 37,000 acres. The Denver Post. Accessed June 11, 2012. Nicholson, K., McGhee, T. (2012, June 12) Colorado wildfire: High Park Fire near Fort Collins now over 43,000 acres with “some containment.” The Denver Post. Accessed June 11, 2012. Nicholson, K., Whaley, M. (2012, June 11) High Park Fire in Larimer County now up to 36,000 acres burned. The Denver Post. Accessed June 11, 2012. Wildfires Rage in Southwestern U.S.